More peanut butter! You really can't go wrong, can you? I didn't think so. And, if you add peanut butter to a rich delicious frosting it's even better. Many people love the peanut butter/chocolate combo. If you've read my previous post about the Peanut Butter Cup Cheesecake Bars you'll know that I do like the combo, even though chocolate isn't my favorite flavor. 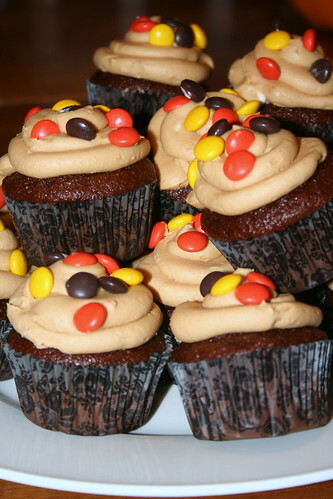 I personally would have preferred to top some vanilla cupcakes with this creamy peanut butter frosting, but I knew that chocolate would be a bigger hit. At the end of the day though, the real star of the show was the frosting. Seriously, this frosting was so good that I could, and probably did, eat it with a spoon. I still want to try it with a perfect vanilla cupcake though - now that sounds like heaven to me! Mix the powdered sugar, peanut butter, butter, vanilla and salt in a large bowl with a mixer on medium-low speed until creamy, scraping down the bowl with a rubber spatula as you work. I loooove peanut butter frosting. I can agree with you that I'm more of a vanilla girl, but for peanut butter I'd definitely pair it with chocolate!